If you have ever been fascinated by the people of China and their colorful holidays, customs and traditional practices, then understanding the various Chinese New Years should make you excited. Among the several Chinese years on the calendar, our concern for the sake of this article is the 2019 Chinese New Year. Following the readings of the Chinese zodiac and calendar, 2019 is the year of the pig. Details About The History Of The Holiday. The Chinese New Year generally refers to the holiday or festival that observes the start of a fresh year on the Chinese calendar. It is indeed one of the most celebrated festivals globally and is the reason behind the biggest migration recorded in the world. It has further influenced the celebration of the lunar new year in neighboring countries to China. What’s more, the Chinese new year is celebrated globally in diverse countries and locations that are largely inhabited by the Chinese population. 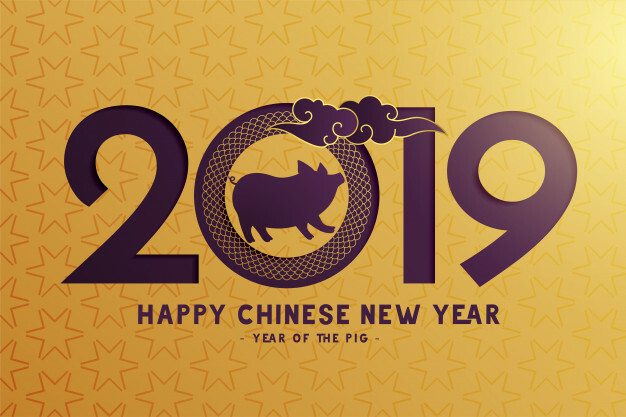 The New Year celebration being the year of the pig will begin on the 5th of February and will end by the 19th of February 2019. Having established how largely celebrated the new year is, let’s look at details about the history of this festival. The Chinese New Year is majorly connected with various customs and myths. The holiday was historically a time when ancestors and deities were honored. Within China, the evening prior to the start of the Chinese new year is often regarded as a time for Chinese families to observe diverse traditions. Some of such traditions are a yearly reunion dinner, giving money out in a red colored envelope, and lighting firecrackers. It is also the time for families to do a thorough clean up of their homes. This is done in line with the need to get rid of bad lucks or ill omens and to pave the way for good fortune. Lastly, families also observe the tradition of decorating their doors or windows with couplets or red paper cuts that signify wealth, happiness, longevity and pleasant fortune. In Northern China, dumplings are a used to as a primary food source to celebrate the festival or holiday. Now that we’ve laid a foundation on the details about the history of the Chinese new year holiday, let’s explore the factors that make the pig significant this year. Following ancient Chinese history, the years and animals in the Chinese calendar are in existence due to readings from the Chinese zodiac. The Chinese zodiacs are comprised of 12 cycles and the pig by itself stands as the Chinese zodiac 12th-year cycle. A particular myth has it that the reason behind the pig being last on the zodiac is the fact that he arrived last when the Jade emperor scheduled a great meeting. Other myths provide when Buddha scheduled a meeting, other animals made it on time, but the pig was the last to depart from the earth and therefore made his appearance at the last meeting. Flowing from that tardiness, some years of the pig in no particular order are 1923, 1947, 1971, 1995, 2007 and now 2019. Be that as it may, there are five elements of the pig according to their respective years, these are the metal pigs, water pigs, wood pigs, fire pigs, and earth pig. This pig year 2019 symbolizes the earth pig and natives of the earth pig don’t take careless risks, are totally calculated, are better being led than leading and love to stay within the comfort of their homes and families.